The cell. 5. Vesicular traffic. Atlas of plant and animal histology. A eukaryotic cell may resemble a big city with several districts. Each of them is specialized in a particular role, such as energy production, manufacturing products, exportation, importation, communication with other cities, recycling, and so on. To work properly, a rich and complex communication system is needed between districts, which is carried out by carriers that go through multiple pathways. Cellular districts are the intracellular compartments and many of them are membrane-bound compartments, i.e. organelles. Each organelle is specialized in one or several functions. For example, endoplasmic reticulum is in charge of synthesizing proteins for secretion and lipids for making membranes, Golgi apparatus produces carbohydrates to be attached to proteins and lipids, and is also a distribution center, lysosomes are the main digestion centers, and mitochondria and chloroplasts synthesize ATP. Communication between some organelles is mediated by vesicles, which carry molecules both in the interior and as part of the membrane of the vesicle. Vesicular trafficking includes all the communication pathways mediated by vesicles, as well as the organelles that send or receive vesicles (Figure 1). There are two main roads in this trafficking road map. One, known as secretory pathway, starts in the endoplasmic reticulum, that sends vesicles to the Golgi apparatus, which in turn sends vesicles targeted to the plasma membrane (exocytosis). This pathway releases molecules to the extracellular space, and also carries molecules to the plasma membrane. The other pathway is an importing pathway that begins at the plasma membrane where vesicles and other large compartments are originated by membrane invagination (endocytosis). These vesicles fuse with the endosomes, which end up becoming lysosomes. Lysosomes degrade the endocyted molecules, both those from the extracellular space and those forming the membrane of the vesicles. It is a degradation pathway. 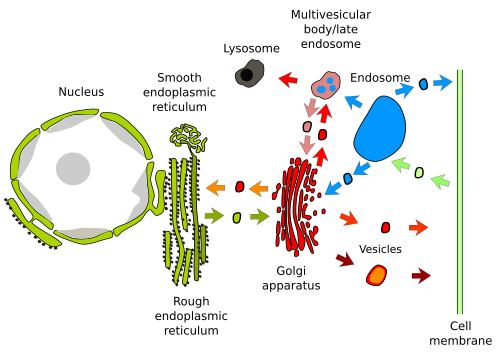 There are many other communication pathways mediated by vesicles so that it looks like that all the organelles are connected through vesicles between each other. This has not been probed yet. However, there is this rule saying that the communication by vesicles between two organelles use to be bidirectional, i.e., the organelle A sends vesicles to the organelle B, and at the same time the organelle A receives vesicles from the organelle B. For example, the endoplasmic reticulum sends vesicles to the Golgi apparatus, which in turn sends vesicles back to the endoplasmic reticulum. The same happens between the plasma membrane and endosomes, and between Golgi apparatus and endosomes. Figure 1. Main pathways of communication mediated by vesicles between organelles. Roads and compartments constitute the vesicular traffic. Communication is usually bidirectional. No all the communication paths are depicted. There are organelles, such as mitochondria, chloroplasts and peroxisomes, which are not part of the vesicular traffic because they do not frequently send nor receive vesicles. However, these organelles communicate with other organelles by other mechanisms. For example, by physical contacts of their membranes. It is frequently observed the mitochondrial external membrane in close apposition to endoplasmic reticulum membranes. Some authors propose that there is a high transfer of molecules, mostly lipids, through these areas of membrane contacts. There are also transporters that exchange lipids between membrane of different compartments.